Paleoindians were the earliest known people in this area. Some 12,500 years ago, sea levels were much lower. These people lived further out in what is now the Gulf. They abandoned the area roughly 4,000 to 3,000 years ago, as glaciers melted and sea levels rose. Occasionally, artifacts such as projectile points and fossils wash up on the beach at the west end of the park. If you find an artifact, leave it in place and let park staff know. Please don’t pocket the past! Atakapa Indians and their relatives moved into Texas around 2,000 years ago, bringing pottery. By the 1820s, most were gone, probably due to smallpox or migration. France and Spain both wanted this territory. Spain claimed it by virtue of Cabeza de Vaca’s 1528 journey; France by LaSalle’s 1685 expedition. By the time the United States bought Louisiana in 1803, the Spanish had prevailed. In 1821, Spain turned the land over to Mexico. Anglo settlers began moving in, some settling in what would later become Beaumont. The park area was a cattle ranch from the 1870s through the 1950s. The state of Texas bought the land for the park from the Planet Oil and Mineral Corporation and Horizon Sales Corporation in 1972. Sea Rim State Park opened to the public in 1977. Any site on the coast can be in the path of a hurricane. Sea Rim has taken two recent hits. 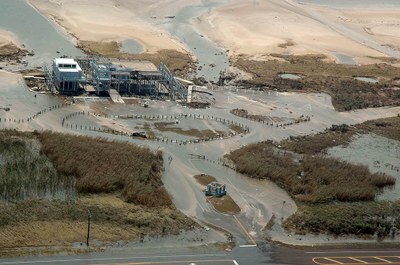 First, Hurricane Rita ravaged the park in 2005. In September 2008, the park was two weeks away from reopening when Hurricane Ike arrived. After massive cleanup, the park opened on a limited basis in 2010. Visitors had to bring their own water, and use portable toilets and a self-pay station. In June 2014, park staff unveiled new facilities, including a camping loop and cabin, an elevated dune boardwalk, and a walk-in day-use area. More park improvements are planned. National Hurricane Center: Hurricanes in History.